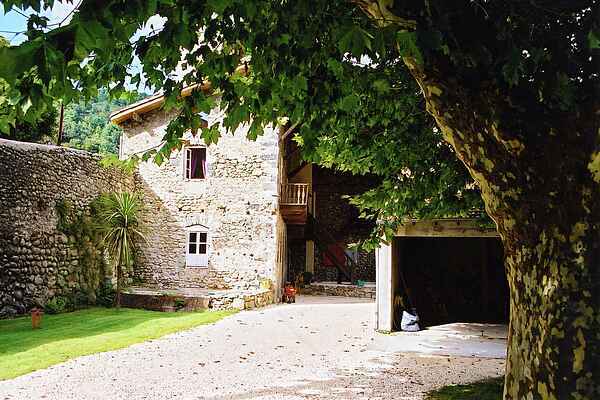 Beautiful old estate, with beautiful garden and right on the river Ardeche. A great location of approx. 5500 m² of private grounds with beautiful pool. There are several properties on the estate and the owner's large country house. This house is suitable for six people. The terrace with garden furniture and BBQ is very nice and covered so you can sit in the shade. From here you look out over the courtyard. The estate has a large shared swimming pool and a shared garden. On site you can play a game of pétanque and there is also a table tennis table. There is also a huge playground with various play equipment. The house is centrally located for numerous excursions and activities that the Ardèche has to offer. Northern: the Gerbier de Jonc, the Mont Mézenc mountain and the Ray-Pic waterfalls; Eastern: the spa town of Vals-les-Bains and the lively town of Aubenas with all kinds of restaurants and shops and southern: the many characteristic and ancient villages such as Balazuc and Vogüé and the Gorges de l'Ardèche, with the famous Pont d'Arc. And west, there arises the Ardèche.In the early and late season you can also rent this property for a short stay. For more information contact our reservation system.